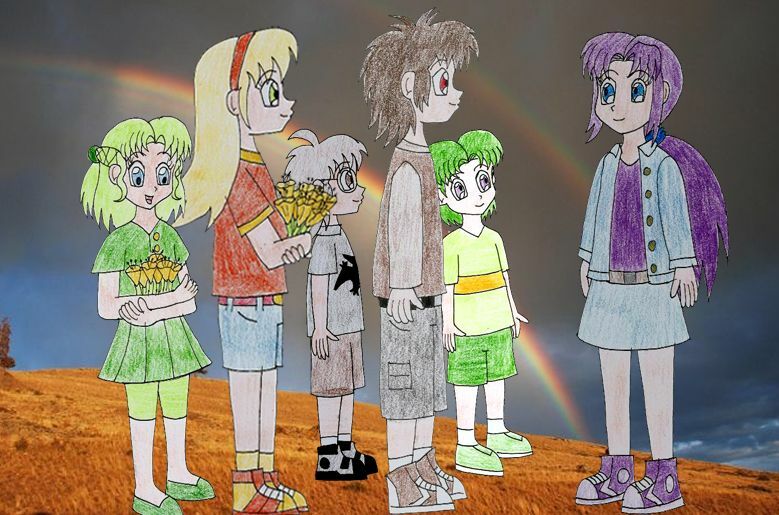 For many months now on Deviant art I have been doing humanized versions of LBT character's in JAPANESE ANIME STYLE and scenes from the LBT films. 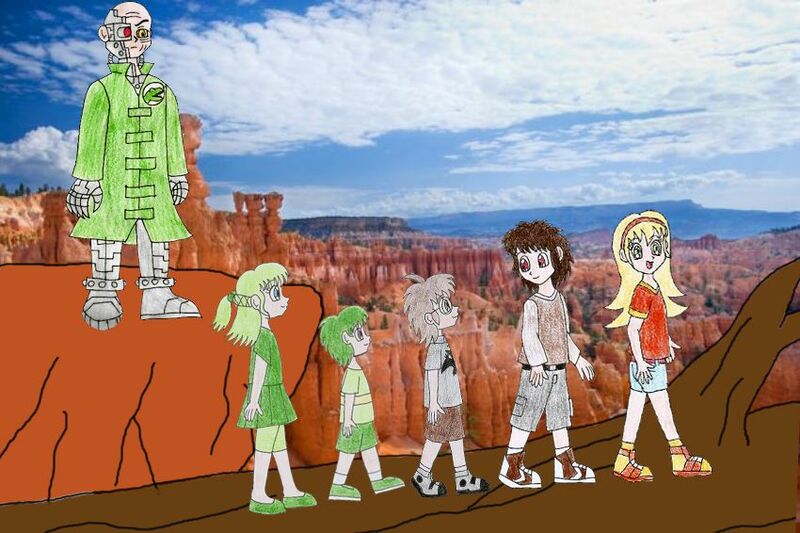 I'll start off with my humanized version of the first LBT movie poster with the gang on a log with Sharptooth in the background. As you can see I made Sharptooth a cyborg, I thought I'd make sharptooth not a 100% human as I think a human guy chasing 5 little kids around would feel a bit awkward, if you know what I mean. 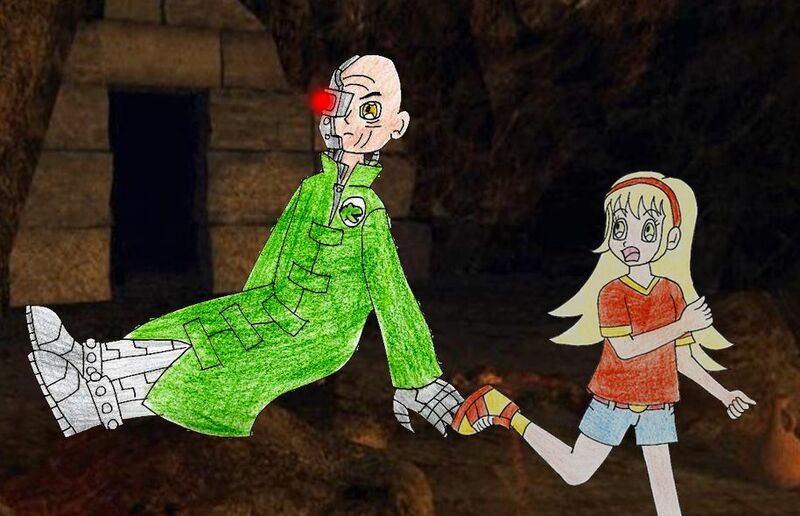 Now I'll show you my drawings of each individual character. I've drawn him as a 10 year old. 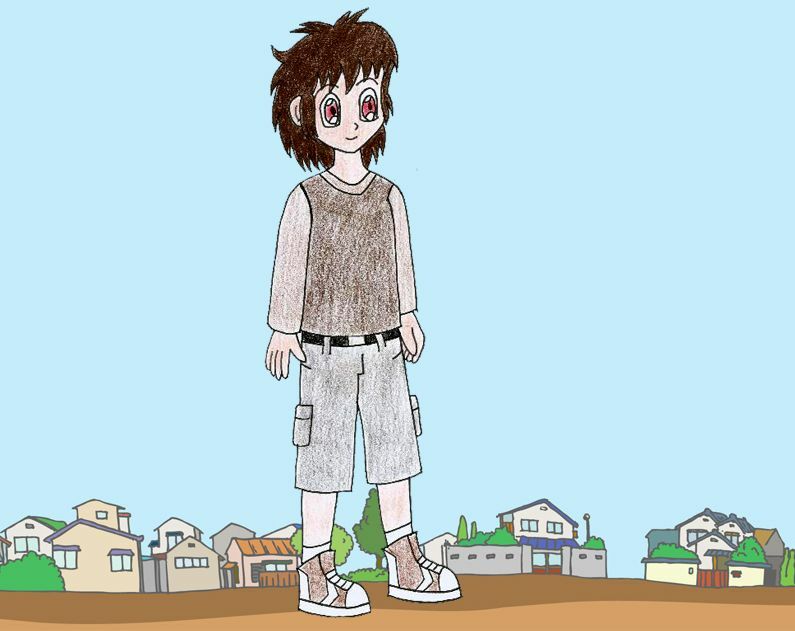 As you can see I've given him brown hair and clothes just like his dino counterpart has brownish skin (though somthimes it's grayish) and red eyes, I also gave him long sleeves to represent his dino counterpart's long neck. Next up my favourite character Cera. Here she is again blowing bubble gum. I ended up doing 2 drawings of her as she's my favourite. 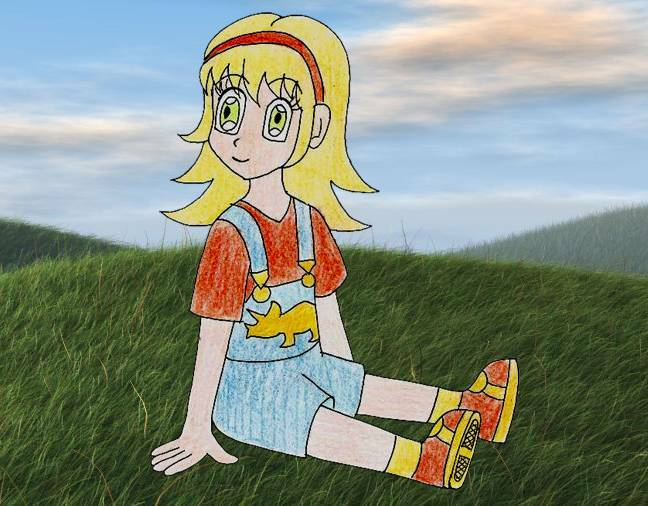 Like Littlefoot I've drawn her as a 10 year old. I'm not sure why but I've always pictured Cera as a blonde if she was human. I think it maybe because the actress who vocied her in the first 4 films "Candace Hutson" is blonde. 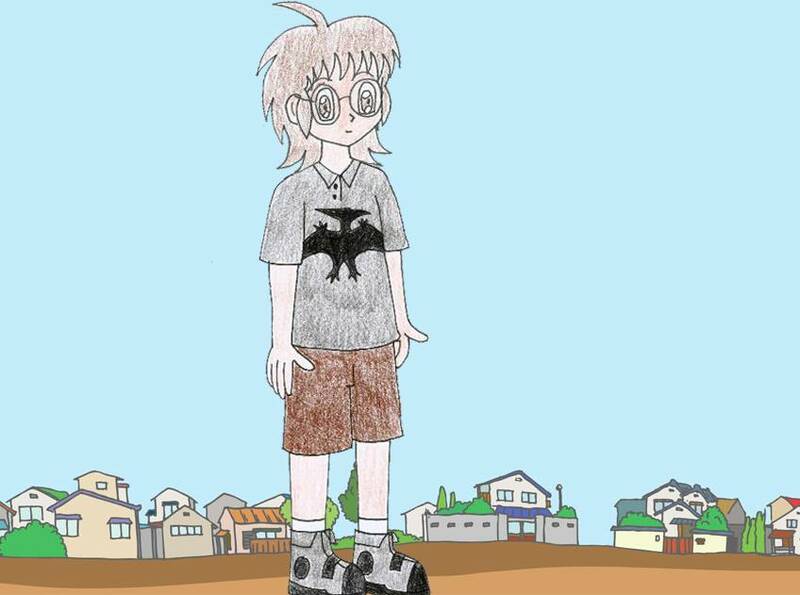 I know some of you are thinking I should have made her hair light orange like the colour of Cera's skin, though I have made her t-shirt and shoes orange. I also made her eyes green like her dino counterpart. Now on to Ducky and Spike. 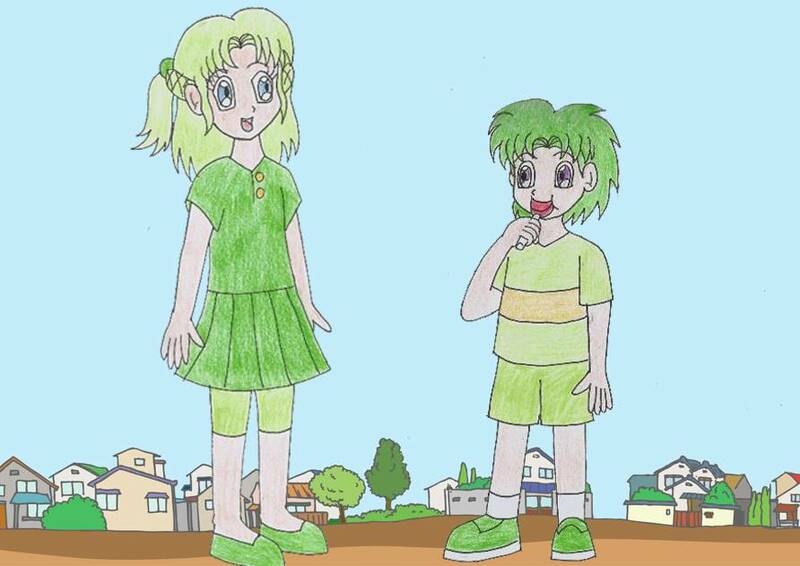 I drew them together as their sort of brother and sister. 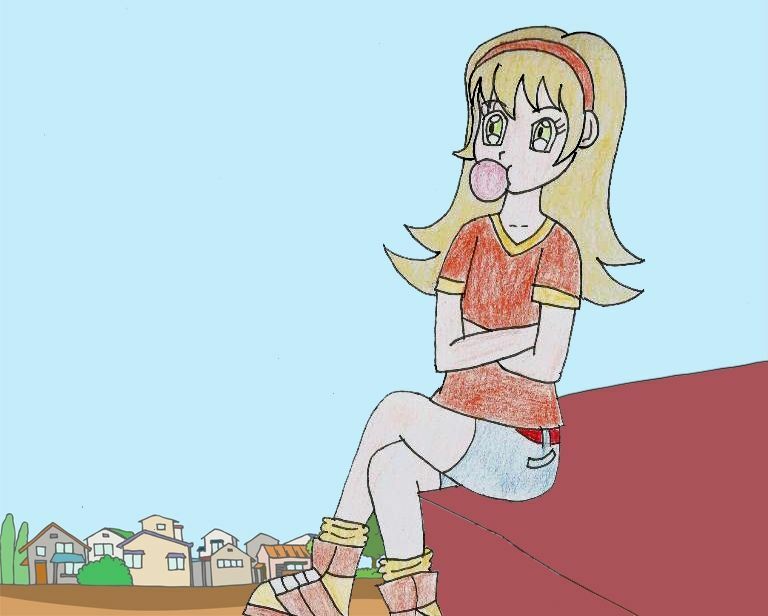 I drew Ducky as a cute little 8 year old as she's pretty much the cutie-pie of the gang. I also gave her a little ponytail to represent the stork on the back of her head. I drawn him as an 8 year old like my human version of Ducky. I've always pictured Petrie with glasses if he were human so I gave him a pair. I also drew that little bit of his hair sticking up to represent his stork on the back of his head. 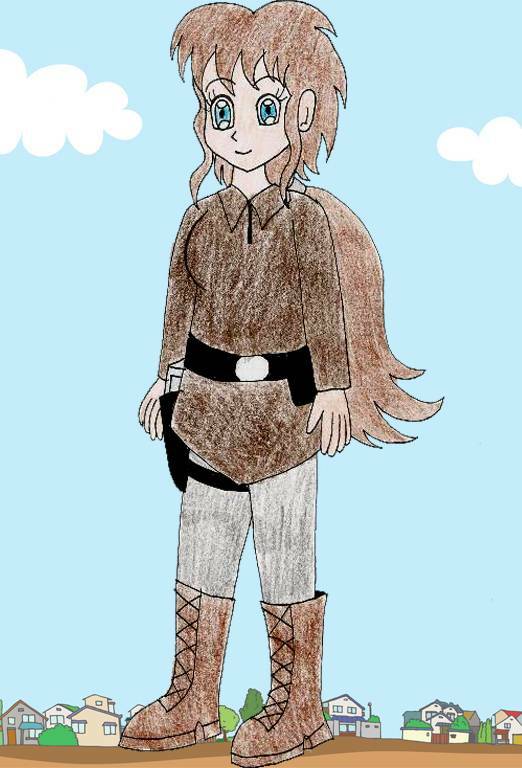 Like Littlefoot I made her hair and outfit different shades of brown. 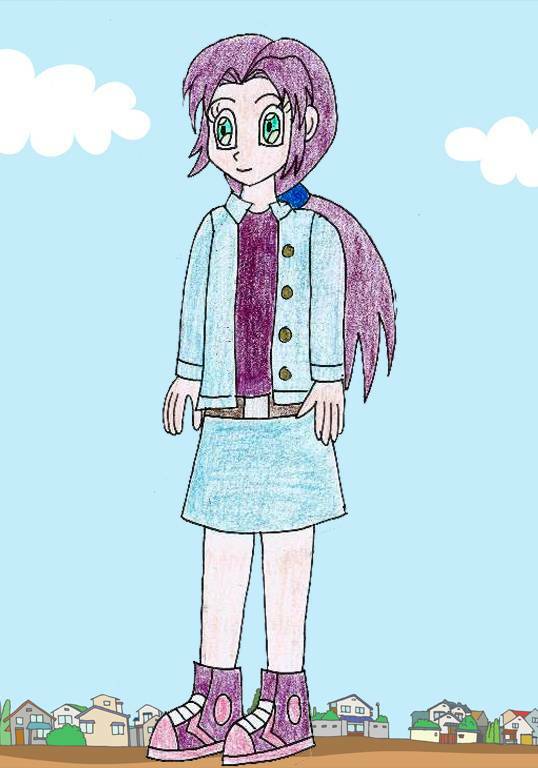 I also based her outfit off a character from doctor who called River Song. And she has a laser gun in holster on her right leg. 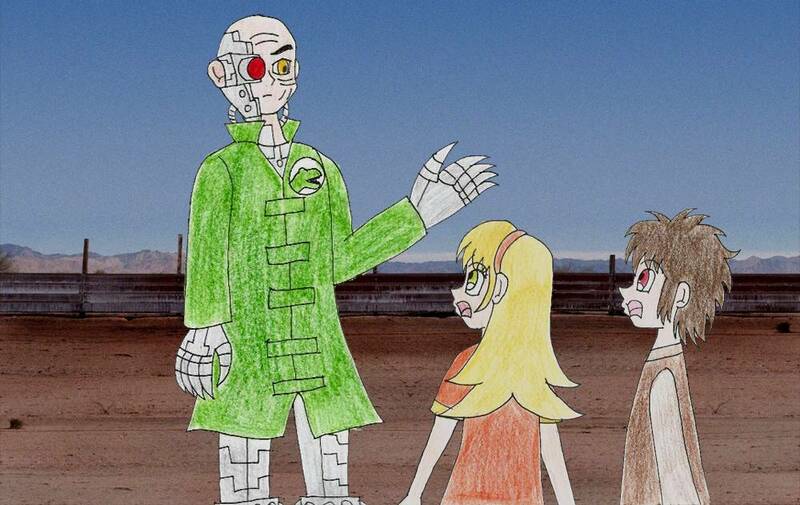 As I said I made him a cyborg to make the fact that he's chasseing little kids around less awkward. Anyway I gave him a red robotic eye as LBT fans will know Shartooth always has one eye shut. In future drawings he'll fire a laser beam from that eye. I also put a little logo with a T-rex head on his cheat. 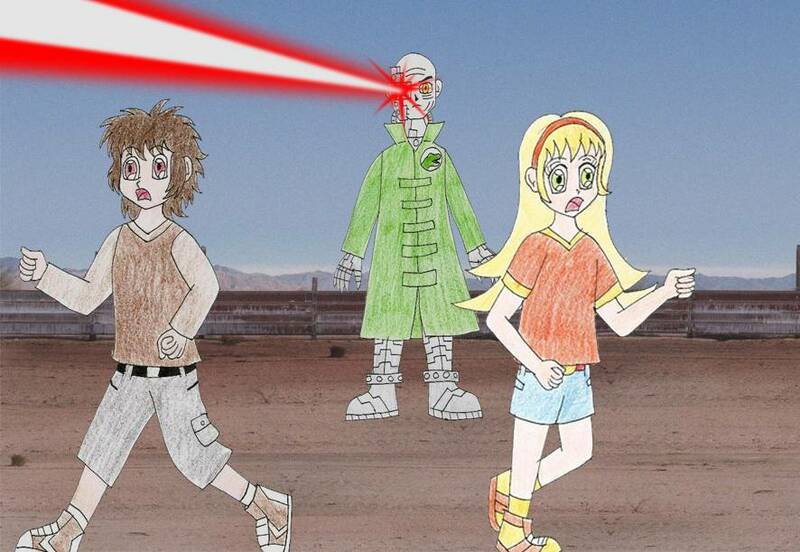 I should also say as he's a cyborg, my humanized LBT drawing are set in a futuristic apocalyptic world. 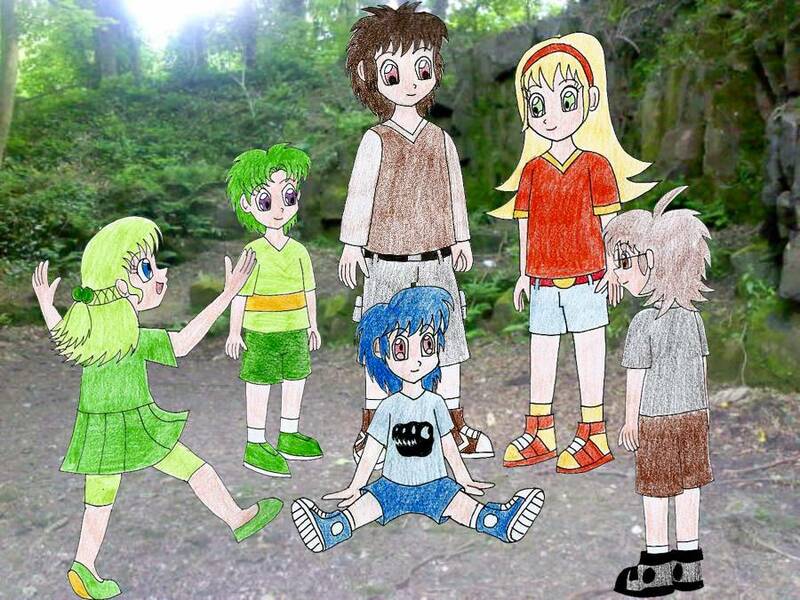 Ok now for humanized characters from the sequels. I've drawn him as a 5 year old as he's the youngest. 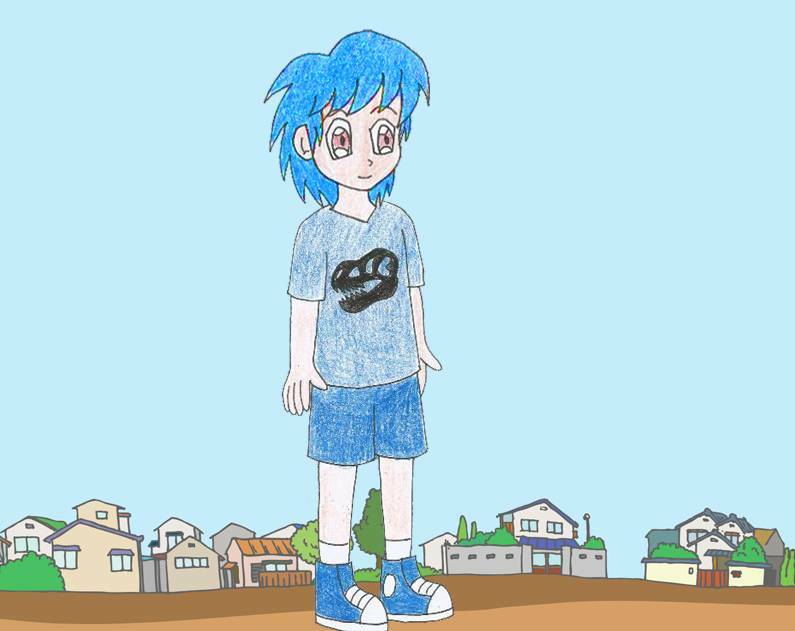 Also this is a humanized version of his LBT 2 design, that's why his hair and outfit is blue and not purple like in the LBT tv show. I got the idea for the T-rex skull on his t-shirt from a t-shirt I got from natural history museum in london. It has a T-rex skull on it saying "BITE ME!". I gave her a long ponytail to represent her long neck. Same reason I gave Littlefoot long sleeve's. You just need to have your pics uploaded to an uploading service like photobucket, imageshack, etc. and copy the direct link and paste it into the text field that pops up if you click on the IMG button. Even though she's not a character I grew up with. I though as I'm a Cera fan, I'd do a humanized version of her half sister Tricia from the 12th movie (and is also in some episodes of the TV show) . She's pretty much just a younger version of Cera but with shorter hair, more girly and pink. It's ok as you can see I've got the hang of it now. Yeah it pretty much dose take place in a futuristic world. Well it's a long tail, but I got most of my ideas for their outfits, and hair cuts etc from other characters in other shows I've seen through out the years. 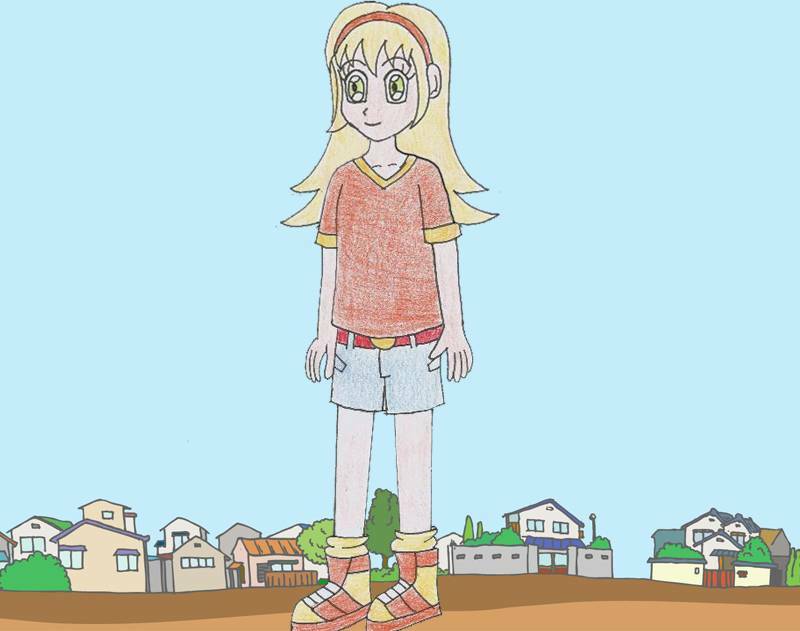 Here's my humanized version of the LBT 2 an 4 VHS covers. These 3 are younger versions of Littlefoot, Cera and Ducky. There based off scenes from the first LBT were they're hatchlings. 5 year old Littlefoot and his mum. Wow! They look really good and I think your ideas as for hair, clothes etc. just fit well in all cases. My personal favourites: Ducky chasing after that butterfly and Tricia so cute! Hey! Those are pretty impressive! Gotta say, I love the anime style of the face and eyes. The re-imaginings of the movie covers are pretty ingenious. I like how the influence and stance of the characters on the box fronts reflect in your artwork. The styling of the clothes is a nice touch too. I like how each of the gang have their own personalised sense of style e.g. Cera with the dungarees as a youngster, Ducky in a floaty dress and Petrie with glasses (dunno why but that image seems to fit him to a T). 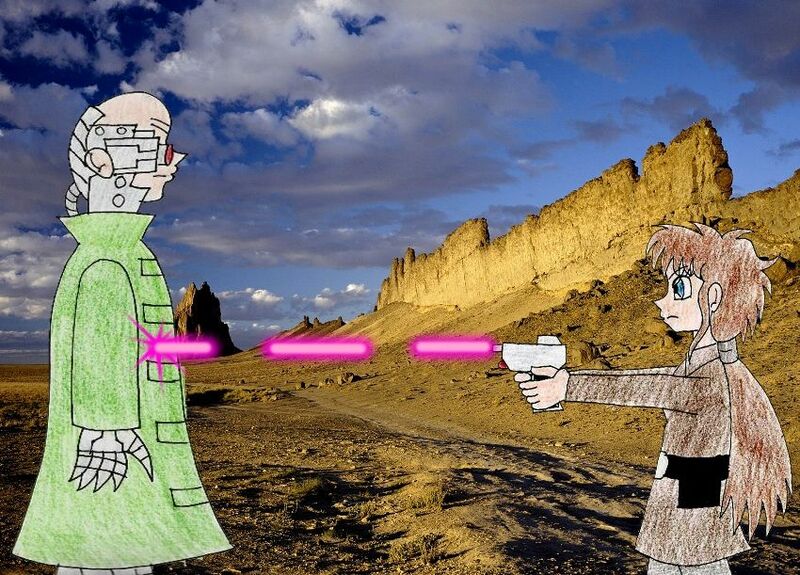 Some really great artwork there Dalekdino. Where did you get the ideas for these? Thanks:) A lot of people on D-art liked my one of Tricia. 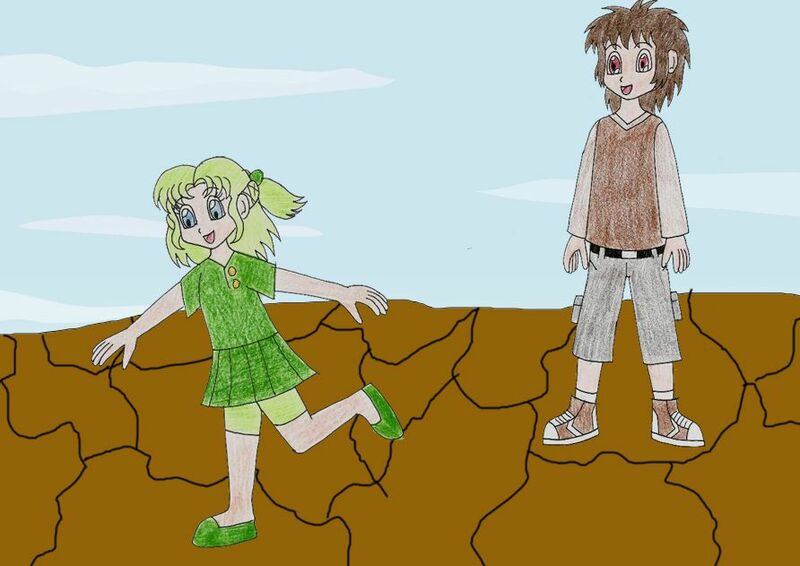 Yes I drew and coloured the characters by hand, then scanned them onto my computer and photoshopped them onto the backgrounds. Well, I got the idea's for the designs from the shed loads of character's and even real life people I've seen over the years and mixed them up. E.G. 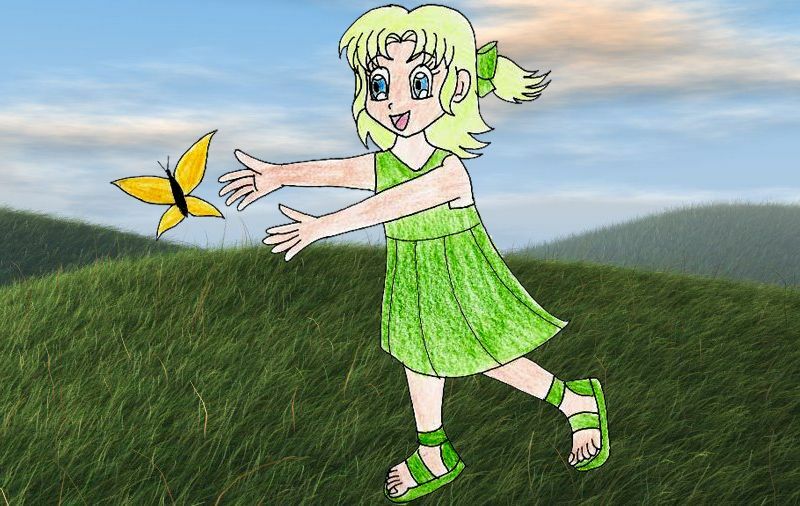 I go the idea for Ducky's hair from Princess Zelda in the manga version of Ocarina of time. And I got the idea for Spike's hair do from a character called Sota in an anime called Inuyasha. 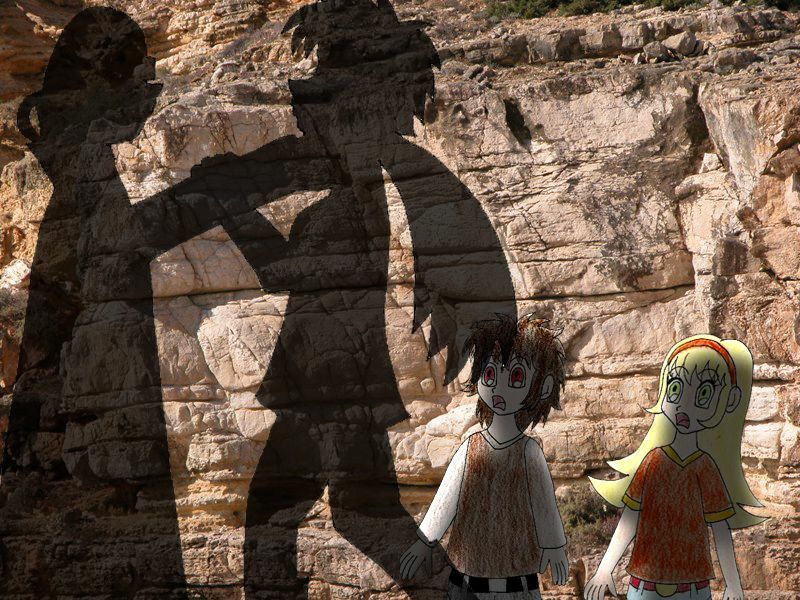 Ok now here's humanized drawings of some parts of the Sharptooth attack scene. cue Whispering winds. I have to say a part of me really didn't want to do this. But the other half of me thought as I've made a human version of Littlefoot's mum and it's one of the most famous scenes in the film... I can't ignore it. Now here's a humanized version of one of the more funnier and cute scenes from the first film, were Ducky plays a game of don't step on a crack or you'll fall and break your back. Until her stomach starts rumbling, or talking as she says XD! Or maybe I should just start leaving feedback in general. I'll be honest; it's not what I'm best at doing. You seem to have really captured all of the characters! Even without the descriptions, I could tell who each of them were, so good job with that. I do agree with your idea of Sharptooth being a cyborg instead of a human, because, well, can I just say I know how creepy it is to be followed around by someone? 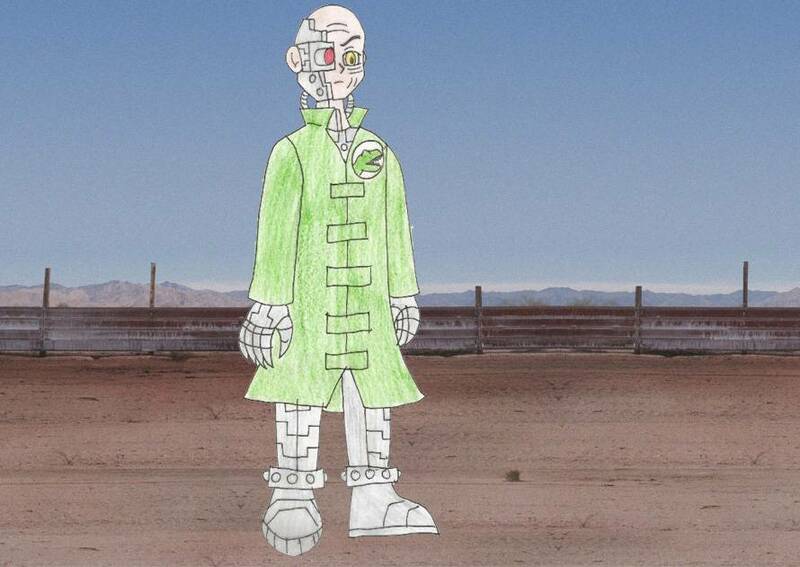 Maybe this cyborg has gone rogue or something? 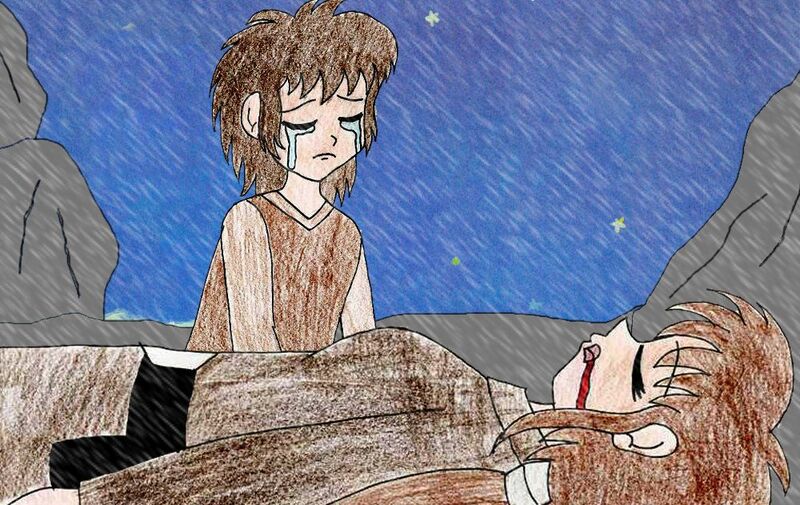 A lot of your drawings a really cute, especially the one of Littlefoot and his mother and the one with him and Ducky. You do have a very cute style of drawing. Am I okay to make just some little recommendations, though? I noticed that you have drawn a lot of 'hands by sides' poses. It looks a little bit awkward and unnatural (I can't talk; I did the same thing ). Maybe you could have them in different standing poses, such maybe hands behind back, arms in front, hands on hips, arms crossed, etc. Also, if the arms are by the sides, the fingers could be a bit more curled instead of straight out to make it look more natural. Another thing is that in some cases, the arms are a little bit short or the waist isn't exactly in the right place. But... I'm sure you'll continue to improve as you continue drawing. That's pretty much all I have to say for this batch. Keep 'em coming! You are really talented! 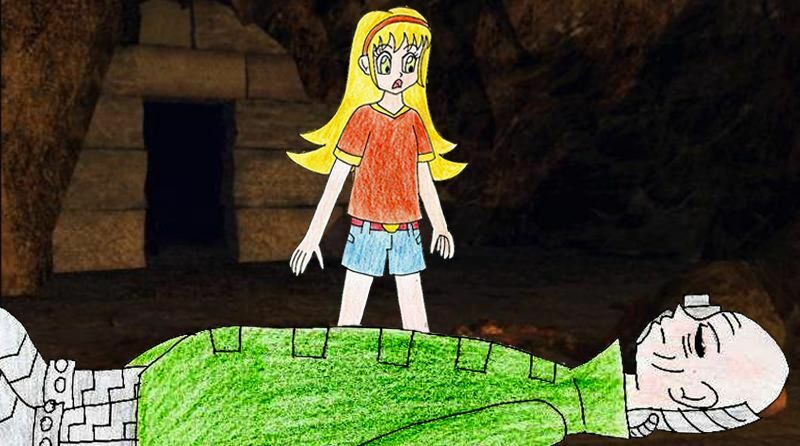 Now here's were Cera comes across Sharptooth to find out he's still alive! Here human Ducky has found human Spike hiding in a box in an old warehouse. 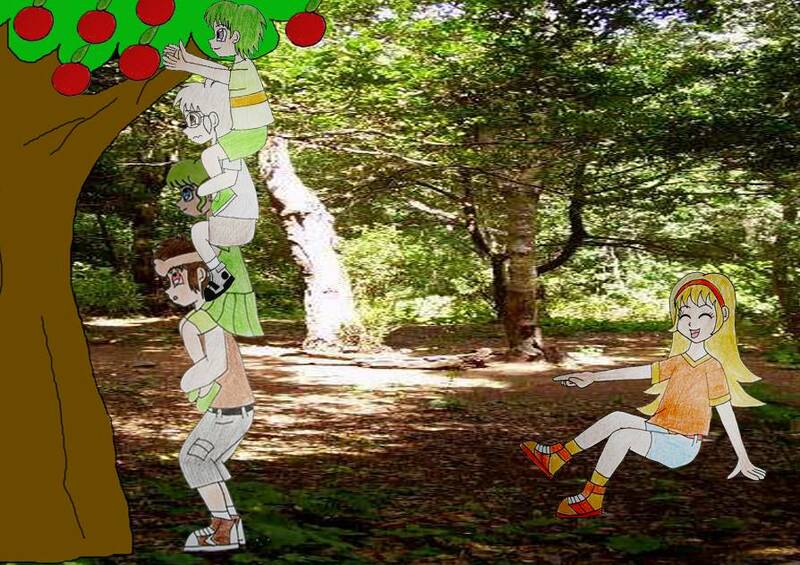 This is based off the scene were Littlefoot, Ducky, Petrie and Spike pile on top of each other to get food out of a tree while, Cera laughs herself silly at them. I have to admit as a kid I was laughing just as much as Cera. Here the human gang are getting apples instead of leafs.